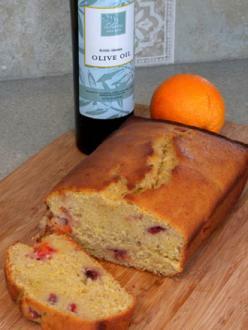 We’ve always known that olive oil makes an excellent alternative to butter in many cake recipes, but this particular “take on cake” makes the most of seasonally-fresh citrus, like blood oranges, and one of our favorite flavored olive oils, The Olive Oil Source Blood Orange Natural Flavor Infused Olive Oil. We found that the flavor of this great cake recipe really intensifies with the switch to our smooth, flavorful blood orange olive oil. And topping a slice off with flavored whipping cream gives us yet another chance to experiment with last month’s featured ingredient, The Olive Oil Source Organic Cask 10 Balsamic Vinegar.